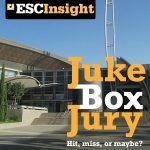 Juke Box Jury episode 3, with Ewan Spence joined by Ross Middleton and Jim Gellalty to judge Finland, Croatia, Norway, Ireland, and Armenia, in our latest podcast. The news is 'we're all rehearsing', but there's still lots of Eurovision discussions to be had. John Lucas predicts the Semi Final running order, while Ewan rounds up the headlines, as the ESC Insight team cover the latest Insight News podcast. Episode 2 of this year's Juke Box Jury series. Ewan Spence sits down with Ellie Chalkley and Scott Reid to discuss entries from Malta, Poland, Italy. Moldova, and Spain, in the latest ESC Insight podcast. Everyone is rehearsing this week, but there's still news on the Eurovision camp site, the power of fans, and a dash of epic promise. It's Ewan''s turn with a Eurovision Thought this week as he talks about song reviews and communities on the latest Insight News podcast. Hit, miss, or maybe is back! In our first of eight episodes of our Juke Box Jury podcast, Samantha Ross and John Paul Lucas join Ewan Spence to judge Azerbaijan, Montenegro, Austria, Hungary, and Australia.